Founder of the Musée Fabre in Montpellier, France, the museum began when the artist donated his collection of art to the city upon his death. As a painter of mostly historical subjects and portraits, Fabre worked in Montpellier and also in Florence when France was in upheaval for a decade during the French Revolution. While in Florence he became a member and teacher of the Florentine Academy of Art, and was patronized by high society and aristocratic tourists. Of these patrons was the dramatist Vittorio Alfieri (1749 – 1803), known as the founder of Italian tragedies. When Alfieri died in 1803, his wife, Princess Louise of Stolberg-Gedern, the Countess of Albany (1752 – 1824), became Fabre’s companion. They may have even married, as it is said that Fabre inherited her fortune when she died, of which he took back to Montpelier to fund his art school. Hanging in the Uffizi Gallery are the portraits Fabre painted of Alfieri and the Countess; they embody his elegant style and realistic precision. Before changing his focus entirely to portraits, Fabre painted historical works, including his well known pieces, The Dying Saint Sebastian and The Death of Narcissus. His training as a painter was supported early on by the art collector Philippe-Laurent de Joubert. 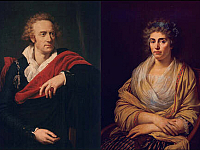 Several of Fabre’s portraits of the Joubert family now hang in the Getty Museum in Los Angeles. His principal teacher was the influential, neoclassical painter, Jacques-Louis David (1728 – 1825). In 1787, Fabre was David’s second pupil to be awarded France’s Royal Academy scholarship, The Prix de Rome, although his teacher had failed to win the award three consecutive times.